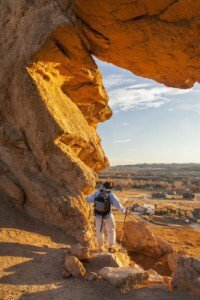 If you love to breathe in the fresh Colorado air, get some exercise, and explore nature, then a trip to Devil’s Backbone Open Space is a must for you. We are fortunate in Loveland to have amazingly close access to great outdoor landscapes, many only a short distance away. In fact, Devil’s Backbone is just a 10.5-mile drive from my Loveland office. The Devil’s Backbone Open space is a 2,198-acre park in Larimer County with 12 miles of trail for hiking, horseback riding, mountain biking, and observing nature. When visiting the park, you can see red-tailed hawks, grasslands with beautiful wildflowers, and the impressive rock formations that give Devil’s Backbone its name. Devil’s Backbone is a great option for people wanting a hike or bike ride at any length or difficulty not far from Loveland. There aren’t many trees, but small cacti and a great view of the Rocky Mountains. You can even bring your furry pals with you, as dogs enjoy the trail as well. I encourage everyone to take advantage of the great nature trails that Devil’s Backbone, Loveland, and all of Colorado have to offer. Living a healthy lifestyle may mean getting outside and exercising, but it doesn’t have to be on boring paved roads or around the block. Parks like Devil’s Backbone provide such great opportunities to hike, bike, and explore, you’ll be having too great of an experience to realize you’re becoming healthier in the process!